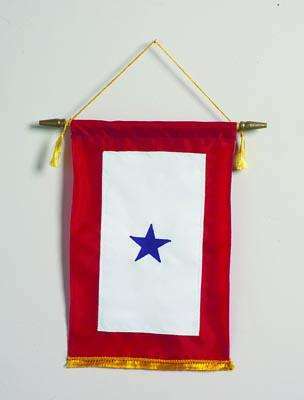 The Blue Star Banner honors those serving in the U.S. Armed Forces. This flag should be displayed in a window of the residence of the immediate family of a member of any branch of the American Military. The blue stars on this service banner represent the number of members in a household serving in the military. The banner is fully sewn and includes a suction cup to attach to a window. Made in the USA.